I was talking with my ITA colleagues, and we were discussing the state of awareness of social learning. And we were somewhat concerned that at least from some evidence, there’re some misconceptions around about social learning. So I thought I’d take another shot at it. This is only a start, but I reckon if those don’t make the case that you should be taking a serious look at incorporating social business into your organization, you are not really concerned. not about (just) formal: as suggested above, social extends from formal out to informal to being an essential part of how business gets done. At core, it’s really about performing better. And that should be your focus, no? So, are you ready to get real about social learning? For a reason I can no longer recall, I was thinking about twitter chats. Two, in particular, came to mind – #lrnchat and #chat2lrn – for one specific reason. And I think it’s worth calling attention to them for that reason. They have a format that for an hour, questions come out every few minutes or so to the hashtag associated with the chat. And the participants answer the questions, continuing to use the hashtag. One of the interesting phenomena to me is that unlike many conversations, the answers can diverge as much as converge, and that’s OK. The topics vary, and in the questions and answers, you can learn a lot. It’s valuable to even see what the questions are, as well as the responses by others. What’s fun about them is that people have fun with it; they riff off others’ posts in fun ways, they make silly tweets, and are generally real people as well as answering the questions. They truly are learning events, and yet very human as well. When you finally meet in person a participant you’ve met online, it can be much more familiar than meeting someone you’ve heard about, because you’ve interacted with them. And while the community that participates isn’t huge, the learnings and insights are, and percolate through subsequent work, eventually impacting the industry. Not completely coincidentally, both are on Thursdays: #lrnchat runs pretty much every Thursday US evening (8:30 ET, 5:30 PT) for an hour, and #chat2lrn runs every other week at 11 AM EST (which is 8 AM PDT when the US is in Daylight Savings Time). What’s amazing is that they run! What you need to know about these two chats (and others as well, I suspect), my specific issue here, is that they’re fully volunteer run. That means that a group of folks has to decide a topic in advance, craft a series of questions, many times arrange an associated post, and arrange to get the questions posted at the appropriate time. This is a significant amount of work to achieve week in and week out. And I know, because I was a #lrnchat moderator for a number of years! So we owe these folks a big thanks for continuing on for a rewarding but effortful task. All these people have other jobs, but their contributions help all of us. There are other chats (specifically #guildchat, Fridays at 2 PM PT, 11AM ET) that follow the same format, but there the principals are salaried. Still, the fact that the organization provides resources to support them is appreciated, though they get some marketing capital as a return. So I want to point out that the folks at lrnchat and chat2lrn are owed thanks by the community (and all the other chats that others participate in that are supported by volunteers and organizations). I salute you! 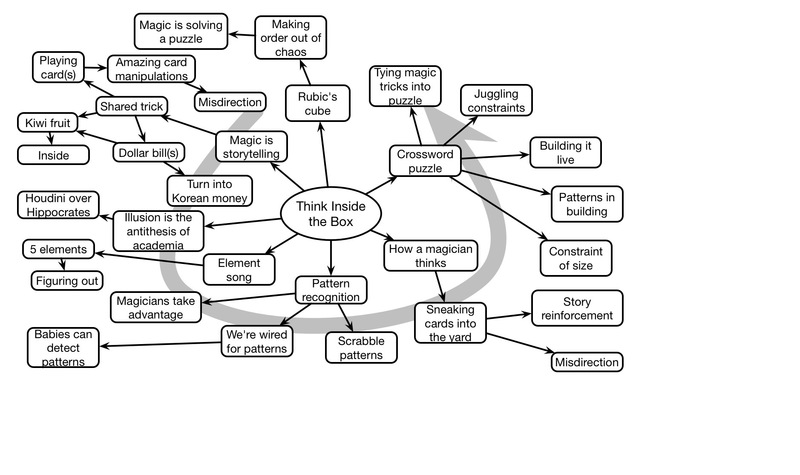 On a recent conversation with some Up to All of Us colleagues, I was reminded about my ‘reimagining learning‘ model. The conversation was about fractals and learning, and how most tools (e.g. the LMS) don’t reflect the conversational nature of learning. And I was thinking again about how we need to shift our thinking, and how we can reframe it. I’d pointed one colleague to Diana Laurillard’s model of conversational learning, as it does reflect a more iterative model of learning with ongoing cycle of action and reflection. 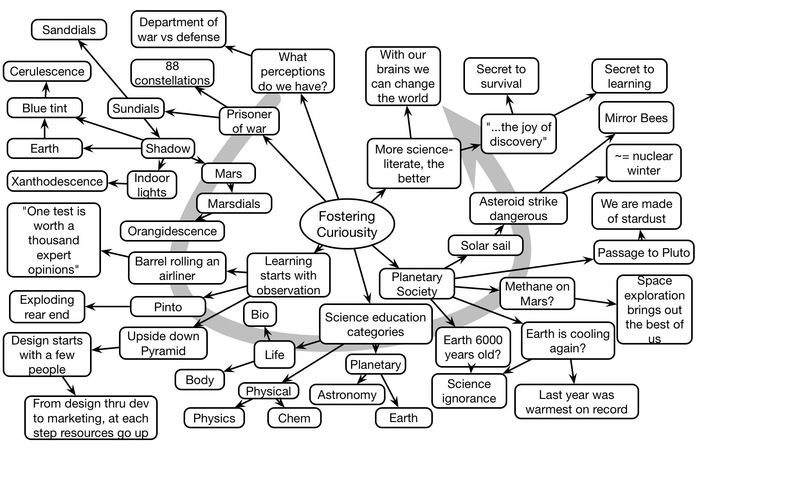 And it occurred to me that I hadn’t conveyed what the learner’s experience with the activity curriculum would look like. It’s implicit, but not explicit. Of course, it’s a series of activities (as opposed to a series of content), but it’s about the product of those activities. The learner (alone or together) creates a response to a challenge, perhaps accessing relevant content as part of the process, and additionally annotates the thinking behind it. 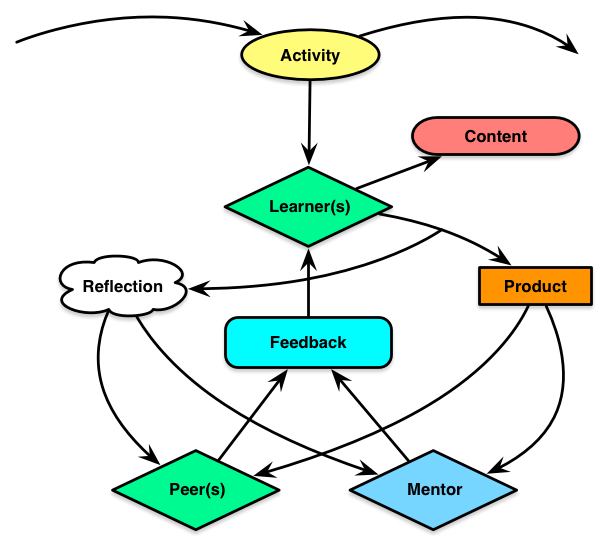 This is then viewed by peers and/or a mentor, who provide feedback to the learner. As a nuance, there should be guidance for that feedback, so that it explicitly represent the concept(s) that should guide the performance. The subsequent activity could be to revise the product, or move along to something else. The point being that the learner is engaged in a meaningful assignment (the activity should be contextualized), and actively reflecting. The subsequent activity, as the Laurillard model suggests, should reflect what the learner’s actions have demonstrated. It’s very much the social cognition benefits I’ve talked about before, in creating and then getting feedback on that representation. The learner’s creating and reflecting, and that provides a rich basis for understanding where they are at. Again, my purpose here is to help make it clear that a curriculum properly should be about doing, not knowing. And this is why I believe that there must be people in the loop. And while much of that burden might be placed on the other learners (if you have a synchronous cohort model), or even the learner with guidance on generating their own feedback, with rubrics for evaluation, but you still benefit from oversight in case the understanding gets off track. We can do a lot to improve asynchronous learning, but we should not neglect social when we can take advantage of it. So, are you wanting to improve your learning? One of the realizations I had in writing the Revolutionize L&D book was how badly we’re out of synch with our brains. I think alignment is a big thing, both from the Coherent Organization perspective of having our flows of information aligned, and in processes that help us move forward in ways that reflect our humanity. In short, I believe we’re out of alignment with our views on how we think, work, and learn. The old folklore that represents the thinking that still permeates L&D today is based upon outdated models. And we really have to understand these differences if we’re to get better. The mistaken belief about thinking is that it’s all done in our head. That is, we keep the knowledge up there, and then when a context comes in we internalize it and make a logical decision and then we act. And what cognitive science says is that this isn’t really the way it works. First, our thinking isn’t all in our heads. We distribute it across representational tools like spreadsheets, documents, and (yes) diagrams. And we don’t make logical decisions without a lot of support or expertise. Instead, we make quick decisions. This means that we should be looking at tools to support thinking, not just trying to put it all in the head. We should be putting as much in the world as we can, and look to scaffold our processes as well. It’s also this notion that we go away and come up with the answer, and that the individual productivity is what matters. It turns out that most innovation, problem-solving, etc, gets better results if we do it together. As I often say “the room is smarter than the smartest person in the room if you manage the process right“. Yet, we don’t. And people work better when they understand why what they’re doing is important and they care about it. We should be looking at ways to get people to work together more and better, but instead we still see hierarchical decision making, restrictive cultures, and more. And, of course, there still persists this model that information dump and knowledge test will lead to new capabilities. That’s a low probability approach. Whereas if you’re serious about learning, you know it’s mostly about spacing contextualized application of that knowledge to solve problems. Instead, we see rapid elearning tools and templates that tart-up quiz questions. The point being, we aren’t recognizing that which makes us special, and augmenting in ways that bring out the best. We’re really running organizations that aren’t designed for humans. Most of the robotic work should and will get automated, so then when we need to find ways to use people to do the things they’re best at. It should be the learning folks, and if they’re not ready, well, they better figure it out or be left out! So let’s get a jump on it, shall we? Annie Murphy Paul closed the Learning Solutions conference with a valuable presentation on the myths in learning. She used a nice structure stating what the problem is and some useful alternate ways to frame the discussion. David Kwong wowed the Learning Solutions audience with amazing tricks and a bit of insight into the nature of magic based upon our brains. As the opening keynote for the always excellent Learning Solutions conference, Bill Nye gave an entertaining talk on the benefits of science and learning, drawing on his experience. I really liked how he paid tribute to his father’s fascination with sundials to get one put on the Mars rovers. I’ll be at Learning Solutions doing a couple sessions, one on measurement, one on culture, next week March 16-18 in Orlando. Both key issues in the ‘revolution‘. And I’ll be at FocusOn Learning June 7-10 in Austin, with a workshop on mobile cognition, an introductory mlearning session, and a talk on context. I’ll also be keynoting the International Conference on eLearning in the Workplace June 15-17 in New York. There’re a couple more that may be showing up, and of course there’re some special events for clients happening in various places as well. If you’re going, say ‘hello’! 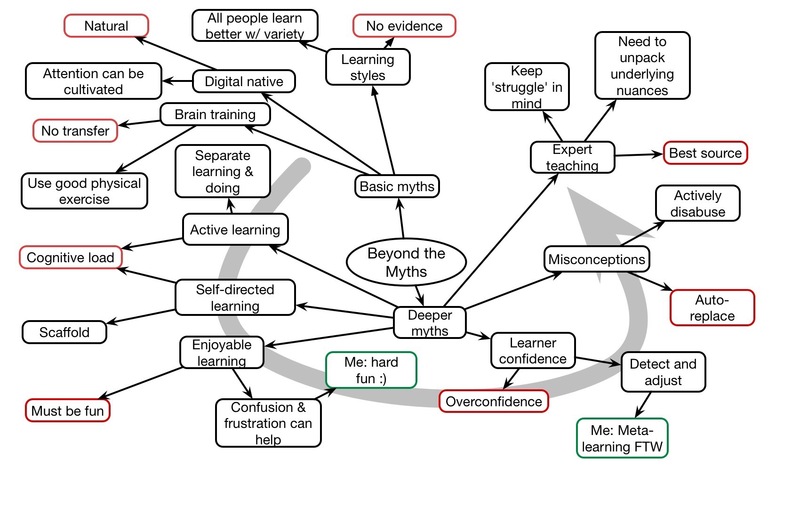 So, as another outcome of the xAPI base camp a few weeks back, I was wondering about tracking not only learning, but meta-learning. That is, not only what activity might mean ‘learning’, but what might mean ‘meta-learning’ is happening? I started wondering about a vocabulary, but realized that you’d have to have activity that you could actually detect that was evidence of meta-learning. And I didn’t know what that was. Naturally, I started diagramming. 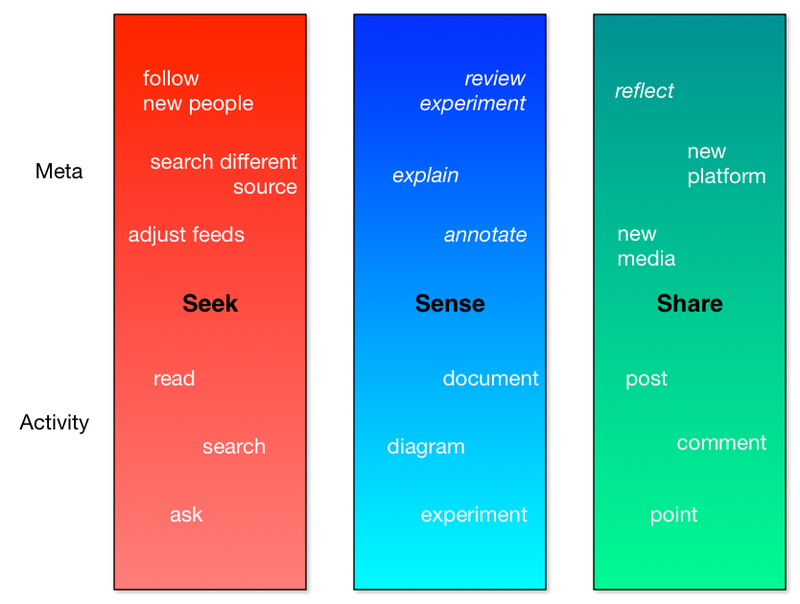 I started with Harold Jarche’s Personal Knowledge Mastery model of Seek-Sense-Share. This is about how you continue to learn in manageable ways, and it served as an organizing framework. To each of the elements, I attributed activities that would constitute learning in that model, and then above it I was thinking what would constitute meta-learning. So, for seek, we start with reading what comes into your feeds, searching about particular topics, and asking questions of your network. Sensing is about reconciling what’s found with your own knowledge. So you could write or present, diagram (see what I did there? ), or experiment. And then to share you can post, or comment, or send a pointer to something. So what are actions that reflect on those actions? For seeking, you can adjust your feeds of what you follow, you can try a different search mechanism, or you can follow new people. These are all detectable, I reckon. For sensing, I see it as a little harder. How do we know when you’re annotating a document with the underlying thinking, not just documenting your progress? How do we know when you’re explaining the thinking behind a diagram (here it’d be about my choice of vertical dimension, and spreading things below and above)? How do we know when you’re actually reviewing your experimental approach or the results? For sharing, it’s a mixed bag. If you choose to use a different media (perhaps it’s relative, like when I created an animation after blogging for > 10 years ;), we might know. If you try out a new social media platform/channel, we can probably note that. If you’re reflecting on your comments from others, how would we know? And this is just one way of carving it up. The point being, meta is good, but detecting and tracking it is hard. We might ask people to annotate it with tags, but that’s problematic too. I have no obvious answers, but it’s a question I had, and I’m thinking out loud about it. I welcome your thoughts, too.